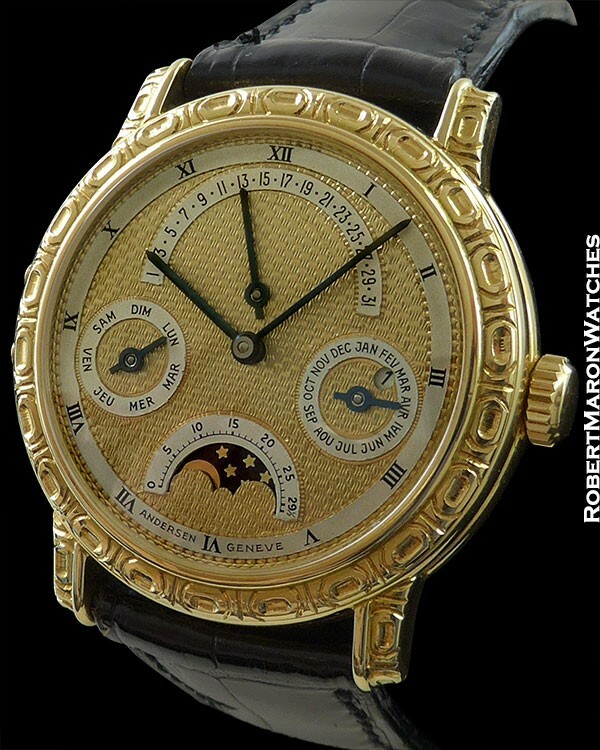 Svend Andersen is a true master watchmaker who you may never have heard of. He started his career in watchmaking in the late 1950s. Mr. Andersen became famous in Switzerland, earning himself the moniker “watchmaker of the impossible” and simultaneously getting himself fired from his job at Gubelin, when he appeared on a Swiss television show with a clock that he built inside a bottle in his spare time! That was in 1969. He went on to spend a decade in the ateliers of Patek Philippe, before finally starting his eponomys brand in 1979. If you have heard of Mr. Andersen, it is almost surely because he is a co-founder of the Academy of Independent Horologists (A.H.C.I. 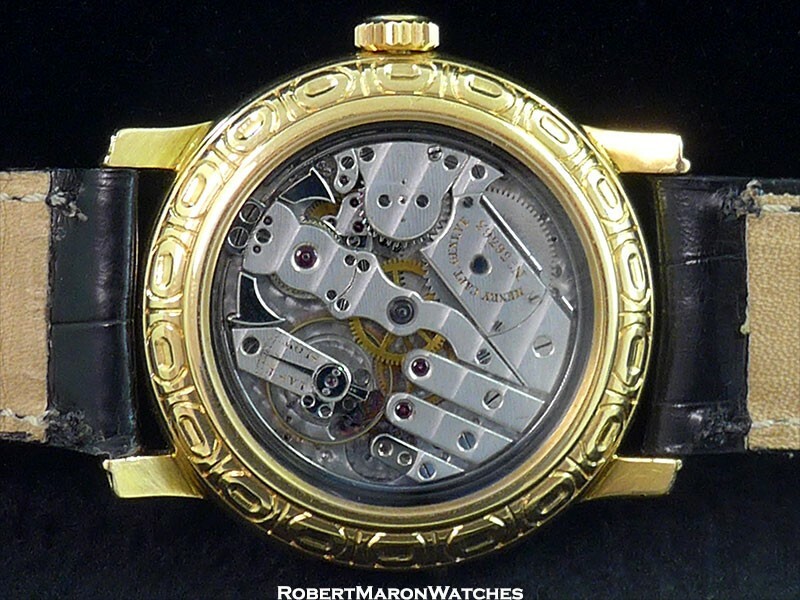 ), which he started in the mid-1980s, which supports gifted and creative watchmakers. A.H.C.I. exhibits each year at The Basel Watch Fair and has helped many watchmakers turn their avant-garde ideas into watches and into brands/businesses. 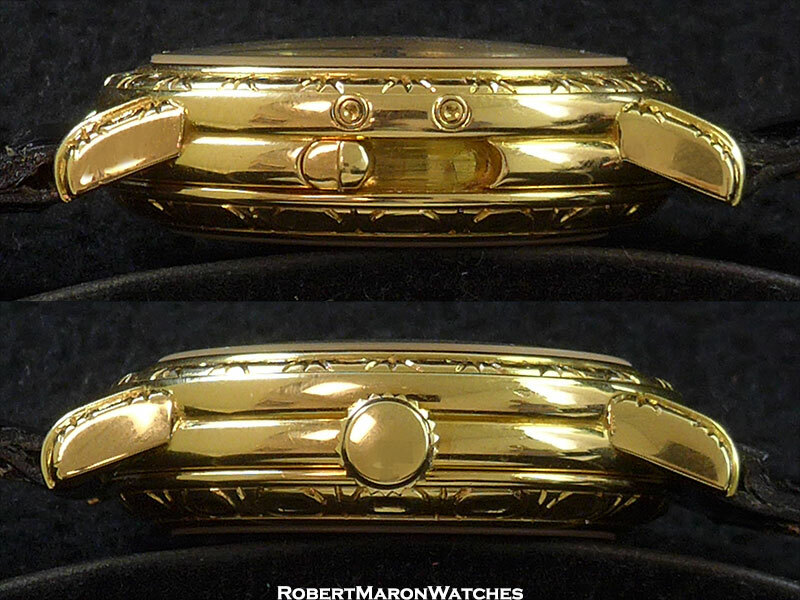 This watch is a piece unique, bespoke watch built for a private client. 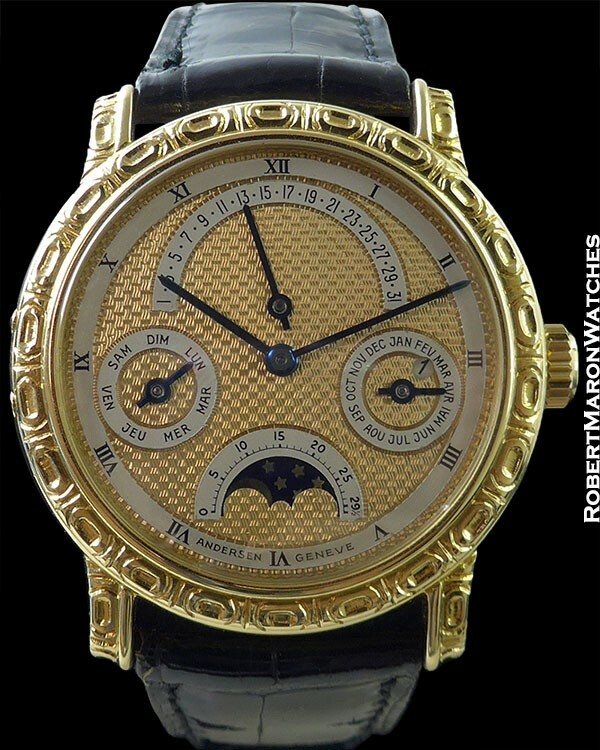 I can say without reservation, that this is among the nicest watches I have ever had the privilege to have on my wrist. Case is 18k with unique engraved pattern repeated throughout. Minute repeater activation slide is cleverly recessed into the case side at 9 o’clock. Dimensions are 37mm diameter by 12mm thick, with sapphire crystals front and display back. This engraved pattern was used on this watch and no other watch. 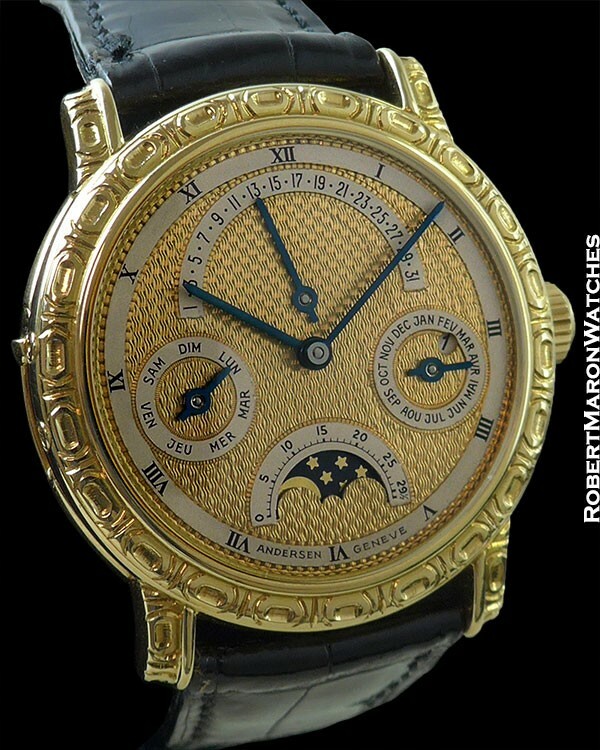 Dial is solid gold with extensive guilloche. White chapter rings for the calendar functions ingeniously make the displays more legible. Roman numerals on the time chapter. Subdial between 3 o’clock and 4 o’clock displays month and has aperture for leap year. 6 o’clock display for moonphase. 9 o’clock subdial shows day. Retrograde scale at the top of the dial displays date. Blued baton style hands. Movement is a vintage manual winding minute repeating caliber made by Henry Capt in Geneva, which Svend Andersen elaborated to include the perpetual calendar function. Truly, this watch is a Masterpiece. Watch is indiscernible from new, on generic crocodile strap, with original 18k buckle.